The Toyota Publica is a small car manufactured by the Japanese automaker Toyota from 1961 to 1978. 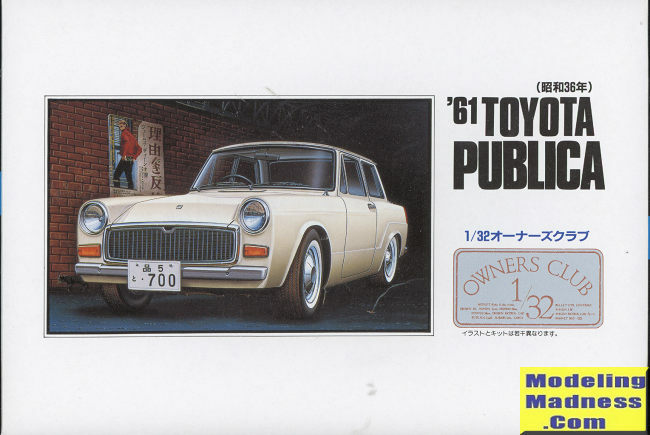 Conceived as a family car to fulfill the requirements of the Japanese Government's "national car concept", it was the smallest Toyota car during that period and was superseded in that role by the Toyota Starlet, which itself started out as a version of the Publica. It was available as a 2-door vehicle only, but in a selection of body styles, ranging from the base sedan through a station wagon, convertible, coupé and even a coupe utility(pickup), which outlived the other models by a decade, and spawned other models, such as the Toyota Sports 800 or Toyota MiniAce. The Publica was inspired by the successful Citroën 2CV which also used a 2-cylinder, air-cooled, horizontally opposed engine, with front-wheel drive. In spite of the fact that the government sources announced that significant tax breaks would be made for cars with engine displacements of less than 500 cc, Toyota decided that such a small engine would provide insufficient power on the highways, and increased the planned displacement to 700 cc. The resulting engine was an air-cooled 697 cc ohv 2-cylinder boxer which produced 28 hp (21 kW), and was known internally as the Toyota U engine. Fortunately for Toyota, the tax incentive announcements did actually not materialize; the displacement did classify in the lowest annual road tax bracket, which helped sales. This is the two door sedan version and like all of the Arii kits in this series, is a curbside (which means the kit does not have an engine). Typical of the series, there are no chrome parts, those requiring the modeler to paint. Fortunately for the modern builder, there are several excellent chrome paints on the market. Construction is quite simple and you will spend most of your time painting. The interior is a full floor pan with wheel wells into which you attach the seats and interior door panels. When building this you also install the wheels and axles. You have one plastic and one metal axle. Wheels are separate from the rubber tires. The axle housing in the rear needs to be installed prior to the rear axle assembly. 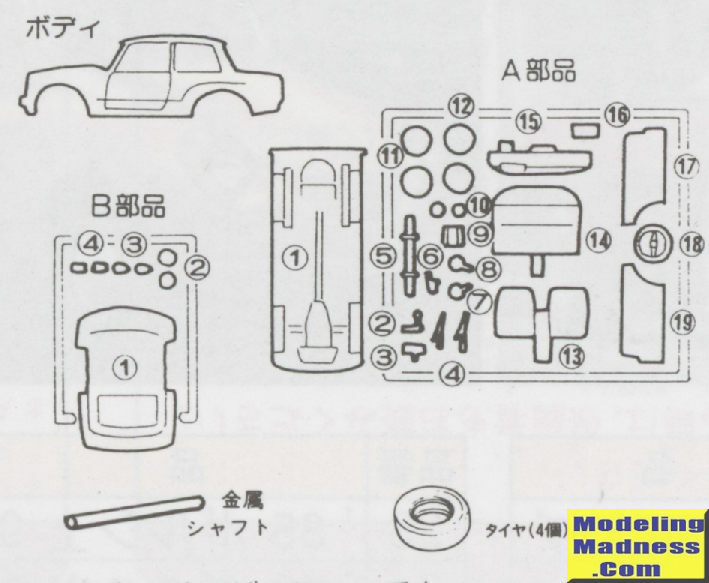 There are decals for the instruments and you have a stick shift and parking brake to install in the center console. Now I know this is probably sounding rather familiar, but most of these kits are the same in the way they are designed and built. The instrument panel with steering wheel installs in the body and this must be installed after the one piece window part. The front and rear of the body are separate parts and it would be recommended to paint the body after gluing on the front and rear panel, but before installing anything else. Headlight lenses are separate clear items as are the tail lights and turn signals. I have had success painting the area behind these last two items with white or chrome and using orange and red Sharpies for color. Once all the bits are attached to the body, it can be glued to the chassis and the exhaust pipe added. Instructions are a single folded sheet with pretty much everything in Japanese. Fortunately, the construction drawings are well done and should not be an issue. You are fairly well on your own in terms of color, however, there are plenty of images on the 'net to help. The small decal sheet provides plates, instruments and a few trim items. These kits are not something you will find in your local hobby shop, at least here in the US. But they can be found easily from Japanese on-line retailers and I've found some at shows. They are a nice distraction from the usual for those of use who don't usually do cars. For those who do, they can provide a break from the normal scale. As a personal note, your editor beetled around Guam in one of these back in the mid 1970s. It was the first generation car and a station wagon. I pretty well had to sit in the back seat to fit. Thanks to me for ordering it.